On March 9th, 2018 the New Jersey Air Conditioning Contractors Association sent a letter to Senator Anthony Bucco. In that letter they state, that the HVACR Contractor alone has the exclusive right to Install, Replace, Connect, Vent, Inspect, Repair, Maintain or Service Hearth Products which includes, gas lines, chimney and space heaters. They claim that according to NJSA 45:16A-2 that the above listed work is to be conducted only by an HVACR Contractor. Yes, this would put an end to the hybrid chimney sweep (CSP) along with all hearth professionals. The NJACCA which wrote this letter has two of it members sitting on the HVACR Board. If we are to secure our future, we need to unite, support the MHP Bill and speak with one voice! The July 5th HVACR Board Meeting Minutes say alot, but probably the worst statement that came out of that meeting is the following: "The installation of flue pipe is considered HVACR work when the appliance in operation produces products of combustion. If you follow that statement up with New Jersey Administrative Code 13:32A-5.9, which declares that "no person, firm, partnership, corporation, or other legal entity shall engage in the business of HVACR contracting or HVACR work unless the person is licensed by the HVACR Board", We have a BIG Problem! On November 8th, 2017 MAHPBA's Government Affairs Team met Once Again with the HVACR Board, in an attempt to push back regulations and get answers about the language that came out of the July 5th, 2017 HVACR Board Meeting. Unfortunately the HVACR Board Stood its ground. 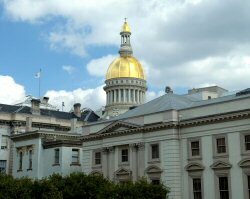 At this point it is MAHPBA's Opinion that without the MHP Bill, the HVACR Boards most recent motion has the potential to do destroy the Hearth Industry in the State of New Jersey. Please get educated and involved. Make a differance and Become part of the solution. If you visit the NJ HVACR Boards Website and read the posted minutes for November 8th, 2017, you would tend to think not much happened at the November meeting. Quite the opposite is true. On November 8th, 2017, MAHPBA Appeared before the HVACR Board with Attorney Steve Corodemus. An attempt was made to push back on the HVACR Boards Direction and the previous July 5th ruling. MAHPBA's Attorney Steve Corodemus made an attempt to get the HVACR Board to Say that the Installation of Hearth Products and the Chimneys that serve those appliances "Was NOT Exclusive" to the HVACR Contractor. The Board would not say it and argued it never makes those types of pronouncements. History indicate otherwise.